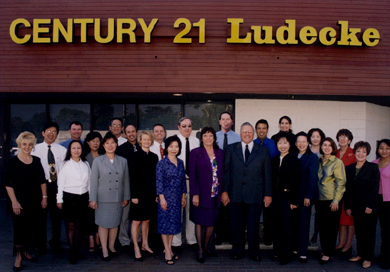 CENTURY 21 Ludecke, Inc. in Arcadia, California, was founded thirty five years ago. The owners of CENTURY 21 Ludecke, Inc. have an accumulation of forty years experience in the field, buying, selling and managing real estate. Mike and Marge, opened their first franchise office in 1983. They followed this with the acquisition of CENTURY 21 Village, Inc. in Sierra Madre just two years later. The CENTURY 21 Ludecke, Inc. Company comprises two successful award winning CENTURY 21® System franchises with over 100 real estate agents. The Property Management Company, Ludecke Property Management was formed in 1990 and current manages over 600 Residential and Commercial properties in both Los Angeles and Orange Counties. Feel free to use the navigation to the right to browse through the varied services, departments and information provided by the Company. Thank you for choosing us as your real estate needs. Our motto is"You don't care how much we know until you know how much we care"
© 2018 CENTURY 21 Ludecke Inc. All rights reserved. CENTURY 21® and the CENTURY 21 Logo are registered service marks owned by Century 21 Real Estate LLC. CENTURY 21 Ludecke Inc fully supports the principles of the Fair Housing Act and the Equal Opportunity Act. Each office is independently owned and operated. Any services or products provided by independently owned and operated franchisees are not provided by, affiliated with or related to Century 21 Real Estate LLC nor any of its affiliated companies.